Zach Stofferahn looks like he could be one of the students at San Diego State who frequent his little restaurant Fish Pit that sits on College Ave. near El Cajon Blvd. In fact, he's an accomplished chef with a long-time love of Japanese food that is the essence of Fish Pit--sushi done his way. Fish Pit, which has been around since October 2016, is all about seafood--poke bowls, fish tacos, ceviche, salads, rolls, and more. The first time I visited, my friend Trish Watlington and I shared his Green Papaya Salad, which was a refreshing mixture of julienned green papaya, mango, and cucumber with sprouts and roasted peanuts tossed in Thai Lime Vinaigrette and his sweet chili sauce. I then dug into a Jumbo Shrimp Taco, made with fired garlic spiced shrimp, mixed cabbage, fresh salsa, and cilantro. Stofferahn started cooking at the age of 14, when he got a job at Wendy's Sukiyaki in Utah, where he was raised. He came to San Diego for his formal culinary education at the Art Institute. He spent time at Cafe Japengo training under chefs Jerry Warner and James Montejano. When he was all of 20 he relocated to Park City, Utah to cook for Sundance Festival attendees. At one point, Stofferahn ran his own catering business in Park City. But then came the financial crash and by 2010, he was back in San Diego where he opened and then ran Sabuku Sushi on Adams Ave. for four years as executive chef. And then he decided that once again it was time for him to go out on his own. He took random gigs, worked at Petco Park, making sushi for local big shots, including the Spanos family, and started catering again. In fact, he still has a mobile sushi bar he takes out to do catering gigs. Then he opened Fish Pit. When you arrive at Fish Pit, you'll see its cool "shack" look. Think Moondoggie's beach shack in Gidget. In fact, Stofferahn built all of it using pallets, stacks of which he still has in his backyard. Seating is limited to about 10--all outdoors along a counter that wraps around three sides. Cool backstory, but it's the food that counts, right? 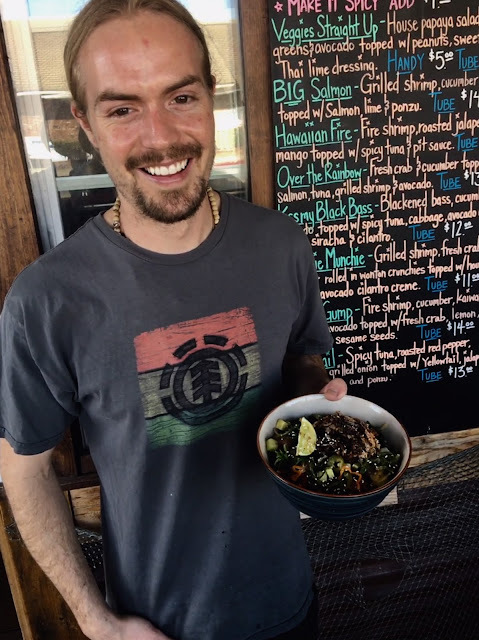 Read the menu on the blackboards and you'll see Stofferahn's dishes are whimsical takes on sushi but the ingredients are local and sustainable--seafood from Catalina Offshore Products, produce from Specialty Produce's farmers market section. He's also conscious of how he deals with food waste. A guy in the neighborhood who grows coffee beans and produce in his backyard for his wife, who is ill and needs impeccably "clean" food, picks up produce and fish waste to fertilize his garden. When it came time to make a dish for San Diego Foodstuff, we decided to focus on his Flaming Poke Bowl. I loved the fresh Big Eye tuna that's featured but it also featured grilled salmon skill. C'mon, who wouldn't want to just snack on grilled salmon skin. Watching Stofferahn prepare a seemingly simple dish revealed his skill. Because it's not at all simple once you get past dicing vegetables. The daikon sticks, for example, require a thorough competency in katsuramuki, a Japanese technique for peeling away a thin, wide, even layer of the daikon around its circumference before slicing it into matchstick-size pieces. There's the skinning of the salmon and then seasoning and grilling it. Stofferahn advises leaving some meat on the skin for flavor and when you grill it, starting with flesh side down, leave it for longer than you think you should--until it starts to lift off the grill, then turn it over to the skin side. Finally, there's the defining Triple X Sauce that is the "flaming" part of the poke bowl. This is a sauce you can use in other dishes. But here's the thing, combine the ingredients a few days out from when you plan to use it because you want the chili slices to marinate in the vinegar. Then you have pickles, some of which will be turned into sauce, some left to top the poke bowl. There are lots of steps to this bowl, but it's not at all complicated. And it's so worth the effort. 1. Heat oils in a skillet and add onion. Sauté until caramelized, then remove from heat and set aside. 2. While the onion is cooking, season the flesh side of the salmon skin and place flesh side down on a hot grill or griddle. Season the skin side and let cook until the flesh side of the grill almost lifts off the grill. Flip it over to grill the skin. Remove and let cool, the slice thinly. 3. In a bowl, mix together the tuna, cucumber, seaweed salad, avocado, and daikon. 4. While putting together the dish, grill the lime quarter on both sides. Set aside. 5. In the bottom of your serving bowl, place the rice on one side and the greens on the other. Spoon in the tuna mixture. Add the three sauces. Arrange caramelized onions on the tuna mixture, then spoon the pickled pepper slices over the top. Add the salmon skin slices and sprinkle the dish with sesame seeds. Finish with the grilled lime quarter. Mix together the ingredients for this spicy sauce at least three days before you expect to use it so the chili slices can absorb the garlic, vinegar, and sugar. Then reserve some of the pickled slices and blend the rest. Slice chilies crosswise. Mix together with garlic cloves. Cover with rice wine vinegar and add sugar. Mix well and refrigerate for at least three days. Remove a couple of tablespoons of the pickled chilies and set aside. Blend the rest until smooth. Fish Pit is located at 4632 College Ave. Visit the website to find out when it's open.